Are you challenged with trying to obtain higher library yields using ever-decreasing input amounts? Each component in the NEBNext® Ultra™ II DNA Library Prep Kit from NEB has been reformulated, resulting in a several-fold increase in library yield with as little as 500 picograms of input DNA. These advances deliver unprecedented performance, while enabling lower inputs and fewer PCR cycles. The Ultra II DNA Library Prep Kit for Illumina meets the challenge of constructing high quality libraries from ever-decreasing input quantities. The reagents for each step in the library preparation workflow have been reformulated to enable high yield preparation of high quality libraries from 500 picograms to 1 microgram of input DNA. This new generation of NEBNext reagents uses a fast, streamlined, automatable workflow and enables use of fewer PCR cycles while also improving GC coverage. The kit is also compatible with PCR-free workflows and is effective with challenging samples such as FFPE DNA. Now also available with optional SPRIselect® beads for clean-up and size-selection steps. To learn more about how NEBNext Ultra II addresses lower input amounts and challenging sample types, download our technical note. A: Libraries were prepared from Human NA19240 genomic DNA using the input amounts and numbers of PCR cycles shown. Manufacturers’ recommendations were followed, with the exception that size selection was omitted. B: Libraries were prepared from Human NA19240 genomic DNA using the input amounts and library prep kits shown without an amplification step, following manufacturers' recommendations. qPCR was used to quantitate adaptor-ligated molecules, and quantitation values were then normalized to the conversion rate for Ultra II. The Ultra II Kit produces the highest rate of conversion to adaptor-ligated molecules, for a broad range of input amounts. Libraries were made using 500 pg, 1 ng and 100 ng of the genomic DNAs shown and the Ultra II DNA Library Prep Kit and sequenced on an Illumina MiSeq®. Reads were mapped using Bowtie 2.2.4 and GC coverage information was calculated using Picard's CollectGCBiasMetrics (v1.117). 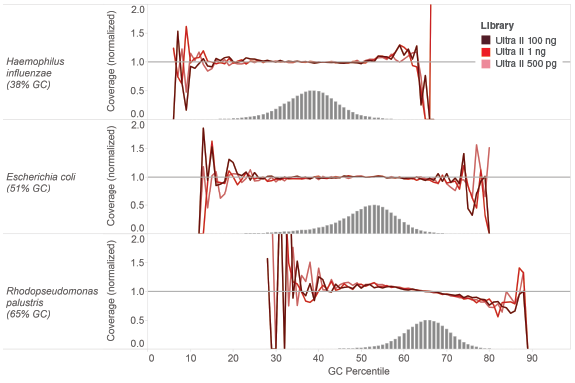 Expected normalized coverage of 1.0 is indicated by the horizontal grey line, the number of 100 bp regions at each GC% is indicated by the vertical grey bars, and the colored lines represent the normalized coverage for each library. Libraries were generated from 100 ng of Human NA19240 genomic DNA using the library prep kits shown, following manufacturers' recommendations, and with no amplification step. 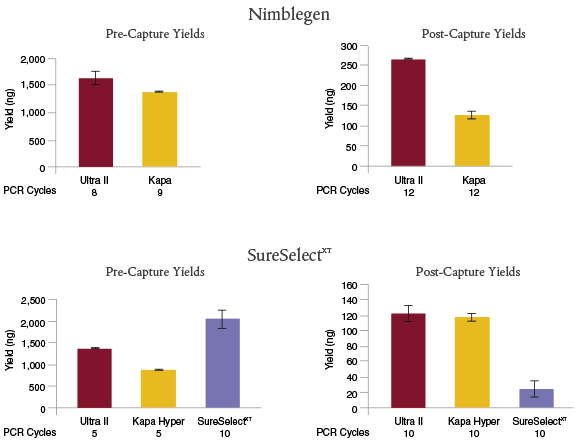 Library yields were determined by qPCR using the NEBNext Library Quant Kit for Illumina. The NEBNext Ultra II Kit produces the highest yields. PCR-free libraries were generated from 100 ng of Human NA19240 genomic DNA using library prep kits shown, following manufacturers’ recommendations, and with no amplification step. Libraries were sequenced on the Illumina NextSeq 500. Reads were mapped to the GRCh37 reference using Bowtie 2.2.4. 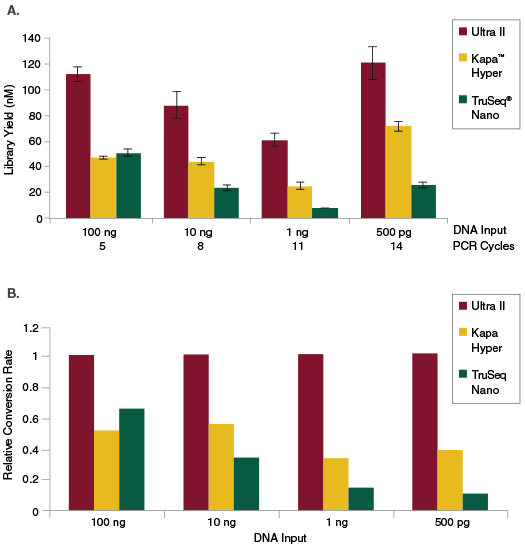 This data illustrates that NEBNext Ultra II DNA Library Prep Kit enables high quality sequence data in PCR-free workflows, even with low input amounts. % Mapped: The percentage of reads mapped to human GRCh37 reference. % Duplication: The percentage of mapped sequence that is marked as duplicate. % Chimeras: The percentage of reads that map outside of a maximum insert size or that have the two ends mapping to different chromosomes. Libraries were prepared from 17–30 ng of human DNA extracted from the FFPE tissue samples listed, amplified using 10 cycles of PCR and sequenced on the Illumina MiSeq. Reads were mapped to the GRCh37 reference genome using Bowtie 2.2.4. % Mapped in Pairs: The percentage of reads whose mate pair was also aligned to the reference. 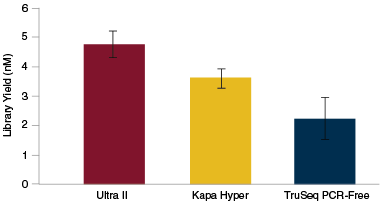 This data illustrates that the NEBNext Ultra II DNA Library Prep Kit for Illumina enables high quality sequence data, even with low input amounts of FFPE DNA. NEBNext Ultra II provides superior yields for target enrichment applications. For Nimblegen® enrichment, libraries were prepared with 100 ng of Human HG02922 genomic DNA, using NEBNext Ultra II with the NEBNext Adaptor and index primers, or the Kapa Library Preparation Kit Illumina Platforms with the SeqCap® Adapter Kit (Roche). Target enrichment was performed with NimbleGen SeqCap Human Exome v3. For SureSelectXT enrichment, libraries were prepared with 200 ng of Human HG02922 genomic DNA, using NEBNext Ultra II or Kapa Hyper with the NEBNext Adaptor and index primers, or the SureSelectXT Reagent Kit, Illumina (ILM) platforms with Herculase® II Fusion DNA Polymerase. Target enrichment was performed with SureSelect® Human All Exon V6. Manufacturers’ recommendations were followed, including use of the recommended number of PCR cycles for pre- and post-capture. NEBNext Ultra II libraries resulted in the highest post-capture yields for both enrichment workflows. AGBT 2018 Wellcome Sanger Institute poster: Thurston. S., et al. (2018). A Large Genome Centre Core Pipeline Refresh. For what type of sample prep/library construction can I use the NEBNext Ultra II DNA Library Prep kit for Illumina? What type and how much starting material do I need to use when preparing libraries using the NEBNext Ultra II DNA Library Prep Kit for Illumina? Is size selection required and what is the recommended method? Can I use the NEBNext Ultra II DNA Library Prep Kit for Illumina reagents for preparing libraries for sequencing on the Ion Torrent PGM or Proton? Are these reagents available in bulk, 96 well, or customized formats? How do I know the concentration of my index primers? Which NEBNext Oligos can be used with this library prep kit? Can I use this NEBNext kit with adaptors and primers from other vendors than NEB? Jung, J-H. et al. (2016) Phytochromes function as thermosensors in Arabidopsis. Science; PubMedID: 27789797 , DOI: 10.1126/science.aaf6005. This product is licensed from Bio-Rad Laboratories, Inc., under U.S. Pat. Nos. 6,627,424, 7,541,170, 7,670,808, 7,666,645 and corresponding patents in other countries for use only in: (a) standard (not real-time) PCR in the research field only, but not real time PCR or digital PCR; (b) real-time PCR for use as a library preparation quantitation tool in Next Generation Sequencing workflows; (c) any in-vitro diagnostics applications, except for applications using real-time PCR or digital PCR; and (d) any non-PCR applications in DNA sequencing, isothermal amplification, and the production of synthetic DNA. Which NEBNext Product Format Should I Choose?